Join us for a cooking day of our Mosaic Program, Harvest for the Homeless. 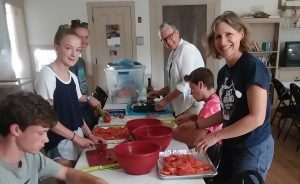 We will prepare a delicious meal, using the vegetables we grew and harvested from the CISV Garden, to be delivered to a local homeless shelter. All ages welcome. Youth 12 and under, please invite an adult to join you.